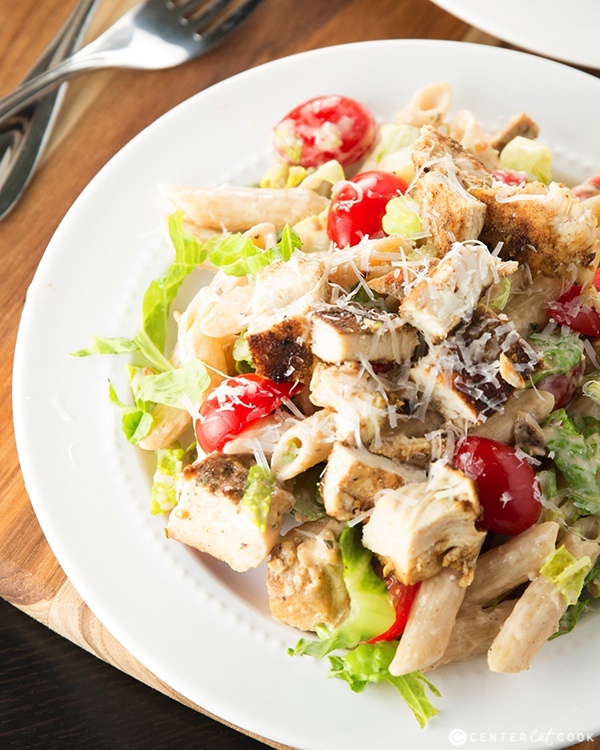 Ceasar Pasta Salad with grilled chicken, lettuce, penne, cherry tomatoes, and parmesan cheese tossed with caesar dressing. It’s easy to make, light and fresh! During the summer months, I am always looking for recipes to make that are light and fresh. Bonus points if they are easy too! This Caesar Pasta Salad fits the bill on all accounts. I like to think of this recipe as a hybrid – it’s part lettuce salad, part pasta salad. It’s got all of the ingredients of a fantastic caesar salad combined with some pasta and the result is probably my new favorite super simple summer supper (try saying that 10 times!). This Caesar Pasta Salad can be pretty versatile. If you’re a vegetarian, simply leave out the grilled chicken and you will still be left with a satisfying salad. We loved the addition of grilled chicken. If you’re short on time and you still want to include chicken, a couple of shortcut options would be to buy a rotisserie chicken from the grocery store OR use my recipe for Easy Slow Cooker Shredded Chicken. Sometimes I’ll season the chicken with some cajun seasoning to make this more of a spicy Caeasar Pasta Salad, and it’s awesome! For the dressing, use whatever caesar salad dressing that you’d like. My favorite go-to bottled version as of late is the Bolthouse Farms Caesar Parmigiano yogurt dressing. They’re not paying me to say that, I just love it and it’s a little bit lighter too! Don’t forget the freshly shaved parmesan cheese. I use my Microplane Grater to get ultra fine shredded cheese. 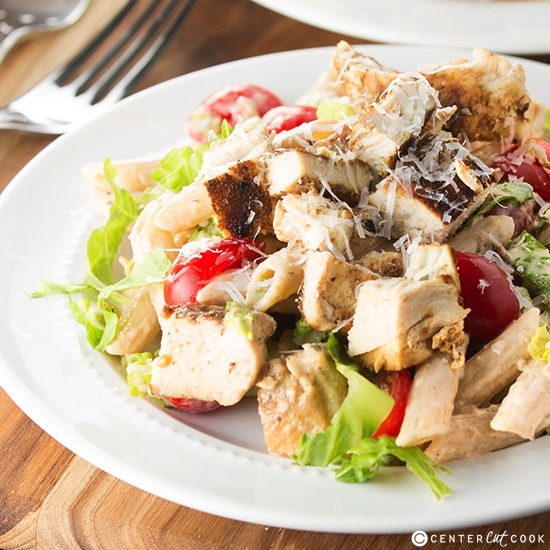 This is a great recipe to make when you’ve already got leftover grilled or shredded chicken on hand because this salad will come together that much faster if you don’t have to worry about grilling chicken. If you like caesar salads and you’re also a sucker for pasta salads, you are going to love this Caesar Pasta Salad. Enjoy! PS: Speaking of pasta salad, have you tried my Cheddar Pasta Salad yet? It’s getting rave reviews! 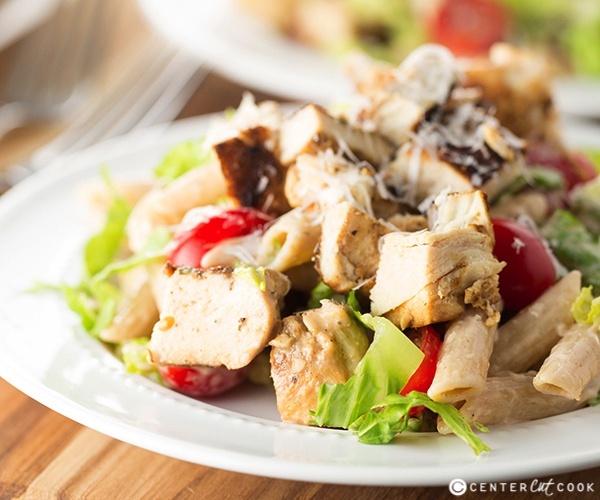 In a large bowl toss together pasta, grilled chicken, lettuce, tomatoes, green onions and grated parmesan cheese. Season it all with 1 teaspoon Italian seasoning and salt and pepper to taste. When ready to serve, toss the salad with 1 cup caesar dressing (use more or less to taste). Serve cold.